There is nothing more annoying than having your manicure and then noticing a few days later that your polish has chipped and you not having the nail polish remover at hand to correct it – I won’t carry a bottle of acetone in my handbag, would you? While I don’t like the scent of nail polish removers, there is no avoiding them if you wear polish but what about a nicer alternative, does it exist? I am pleasantly surprised to say that it does and it comes from a brand called Fresh Therapies that was started by Hampshire based Nicola Dickinson, who had no background in beauty or cosmetics, yet managed to create something that I am starting to rely on without wrinkling my nose. Nicola used to work in the office, doing general admin for various companies but when motherhood beckoned, she switched to working in the evenings, so she could dedicate herself to raising her children. All the while she managed to gain experience in shop work, as well as customer service roles – once you have children, customer relationship takes a totally new meaning, as you start to understand life’s pressures more astutely. Nicola also learnt massage and beauty, doing part-time courses at college, followed by three years training and working in high street salons. And then, in 2006, she had a light bulb moment and started Fresh Therapies with a friend, providing beauty treatments. Due to ill-health Nicola’s friend had to stop work but Nicola persevered and launched her natural nail polish in 2011. Nicola found a company to make the formula for her ( it took about eight months to create a ‘perfect’ product and Nicola calls the lady, who helped her formulate, ‘amazing’ ), as she has no formulating background but was precise when laying out her ideas on the look, texture and smell of the product. Fresh Therapies natural nail polish remover ingredients are sourced from different countries throughout Europe but Nicola makes sure that all of the suppliers that she uses comply with the ‘no testing on animals’ but I consider it to be a British beauty brand as the final formula is made in the UK. What makes Fresh Therapies polish remover different to the one you might be currently using? Well, for starters, according to Nicola, ” its formula is kinder to nails, as it doesn’t have all the chemicals that ‘strip’ the natural oil away from your nail plate, causing your nails to go weak, dry, brittle and dehydrated over time. It also does not dry out the surrounding cuticle, as other conventional polish removers do”. FT nail polish itself doesn’t have an overwhelming chemical smell that the regular nail polish remover does ( you also need to be mindful when using a traditional nail polish remover, as you don’t want it to get on your skin or even worse, into your eyes ) and actually has a slight lime zestiness to it. Ingredients: Dimenthyl Glutarate, Dimethyl Adipate, Dimethyl Succinate Ethylhexyl Palmitate ( coconut derived ) Limonene, Citrus Aurantifolia Oil ( lime peel ), Citral Linalool ( vegetable derived ). 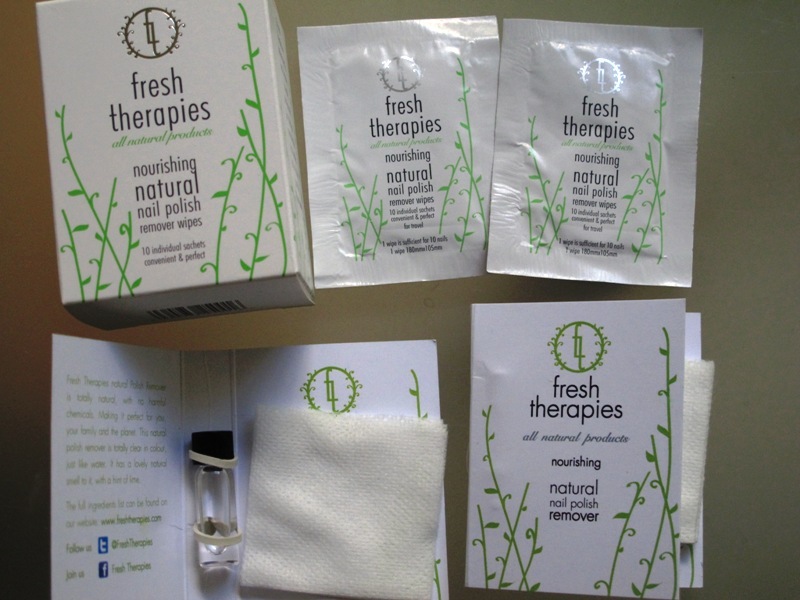 Fresh Therapies Natural Nail Polish Remover, 50 mls, £8.99 or £7.50 for a box of 10 pocket wipes. This nail polish remover is biodegradable and is suitable even if you have a sensitive skin. It isn’t suitable to use on false nails. If there is a small criticism that I have, is that I think £3 is a little pricey for p&p ( postal costs deserve a separate article, as it is a bain of small businesses and an endless source of frustration for both customers and customer services of brands ) when you consider that it is almost half the price of the product you are buying. Fingers crossed for more & more stockists taking this brand on board. Innovative skincare from Su-Man Hsu: part one, ingredientsFurry creaters-friends or foes? dear Charlie, thank you for your comment. I wrote the review as a consumer but you make some great points from the point of view of a small business owner. I learnt something new from you today!